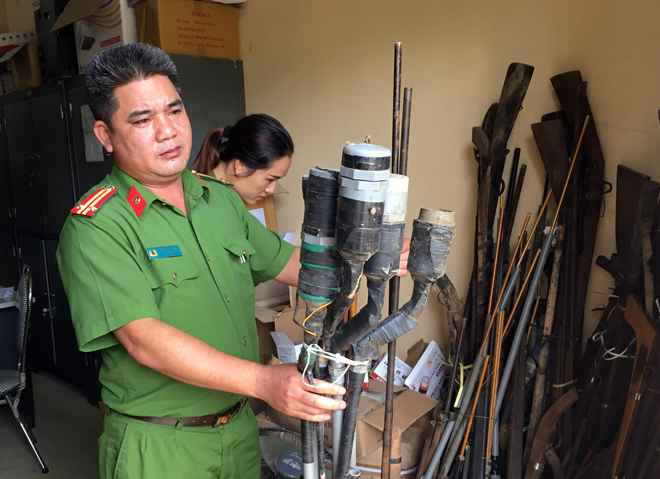 PSNews - Thanks to great efforts and persistence in mass mobilization of local police officers, residents in Van Ho district, Son La province have given up a huge number of weapons and explosives to the police. Van Ho district of the northern mountainous province of Son La has a complicated drug crime situation. The local people’s education level and general knowledge are comparatively low; as a result, they are not very aware of observing the laws. Son La Police succeed in mobilizing people to surrender weapons and explosives. In the past, due to their living habits, many people still store and use hunting guns and handmade pistols to hunt wildlife animals, risking local security and safety. Against this context, the local police force took various measures to mobilize people to hand their guns and homemade weapons to the police. To reach the target, police officers held public meetings with local people and went to each house to explain about the laws on the management and use of weapons, explosives, supporting tools, as well as negative effects of the illegal possession of weapons. In the past 6 months, the Van Ho police have called on people to surrender 1,230 guns of various kinds, a grenade and other homemade weapons. Speaking to the Public Security Newspaper, Lieutenant Colonel Duong Manh Hung, Head of the Administrative Police Team for Social Order of the Van Ho District Police Station emphasized that, despite many difficulties, police officers of Van Ho district did not give up. They sought many methods to mobilize people to surrender weapons, creating a healthy and safe environment in the locality beneficial to local socio-economic development. According to Hung, local police officers received great support from reputable persons of local communities, during their task performance, and the very support contributed significantly to their successes.